After weeks of struggling against her illness, the bright star of Pakistani youth, Arfa Karim Randhawa, succumbed to her illness and passed away. However, throughout her illness, she succeeded in evoking compassion from a friend thousands of miles away. As soon as he came to know of Arfa’s illness, Microsoft Chairman Bill Gates left no stone unturned to ensure that Arfa received the best treatment available, all expenses paid by Bill gates himself. Bill Gates had first met Arfa in 2005 when he invited her to visit the Microsoft Headquarters. 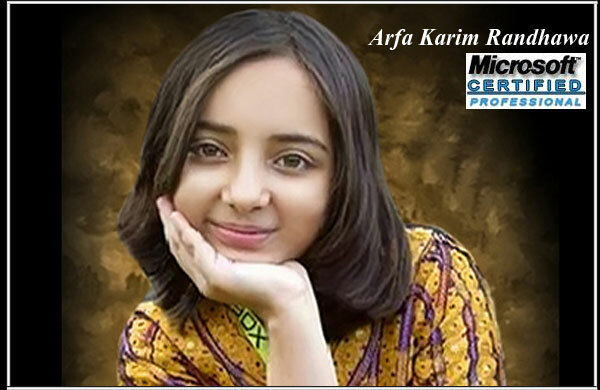 In 2004, Arfa had become the youngest Microsoft Certified Professional in the world at the age of 9. This accomplishment won her worldwide fame and her family had many hopes for the future of this bright young girl, until her untimely death. Amjad Karim Randhawa, father of the late Arfa Karim, received a telephone call from Bill Gates and was touched by Bill Gates’ generous offer to bear all the necessary expenses of Arfa’s treatment in the United States. After the kind offer was accepted by Arfa’s father, Bill Gates got his doctors to connect with Arfa’s doctors in Pakistan to be apprised about the illness affecting Arfa’s health. While doctors on both sides remained in constant communication with one another over the Internet, Arfa’s doctors in Pakistan expressed doubts about relocating Arfa to the United States for treatment. The problem was that Arfa was already put on ventilator support, making any such attempt at relocation a threat to her well-being. In no time after her fame as the youngest Microsoft Certified Professional spread across the world, Arfa Karim was attracting the attention of scientific institutions around the globe. At the time that she first contracted her illness, Arfa was working on a NASA project. Arfa suffered from an episode of epileptic seizure that was further complicated by a cardiac arrest. However, as Arfa’s brain continued to operate despite the epileptic seizure, doctors remained hopeful of her recovery. The basis for this optimism was the EEG report of Arfa, according to which doctors not only in Pakistan but those in other countries too thought that Arfa would pull through. However, they were constrained by the limited resources available in Pakistan for Arfa’s treatment.